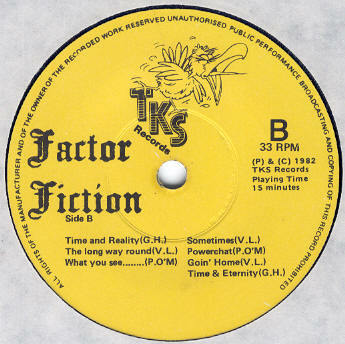 Briefly known as Vice Versa, Factor Fiction was basically Orpheus with the addition of vocalist Mike O'Brien and a much better bandname. O'Brien, Lyons and O'Mahony were all ex Berserk, Cork's first punk band. 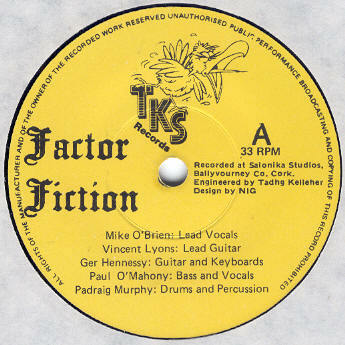 Factor Fiction recorded a seven song EP at the studio in Ballyvourney Co. Cork owned by Tadgh Kelliher of trad group Salonika. The single was released on their TKS own label. The only review I found compared it to The Adverts but this isn't particularly accurate. It's new wave influenced rock with good guitars. They also recorded a studio session for the Fanning show in 1982. Around this time O'Mahony and O'Brien also recorded as Loko Parentis. O'Brien left in 1983 and the band split sometime after. Lyons, O'Mahony and Murphy recorded again in 1986 as Totally Unpredictable.